Having trekked over much of the globe, if we were forced to pick just one place to visit above all others, it would be Africa. The most eye-opening, awe-striking journey unfolded before our very eyes touring Kenya, Rwanda & Tanzania. 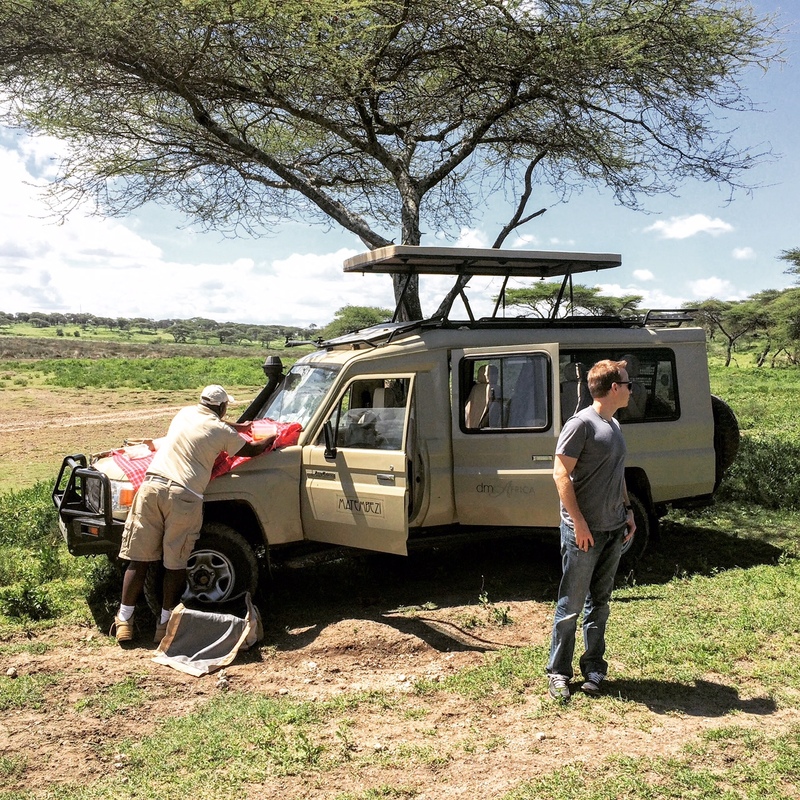 We opted to wake up and fall asleep on the Serengeti during the Great Migration with our own personal staff and chef. 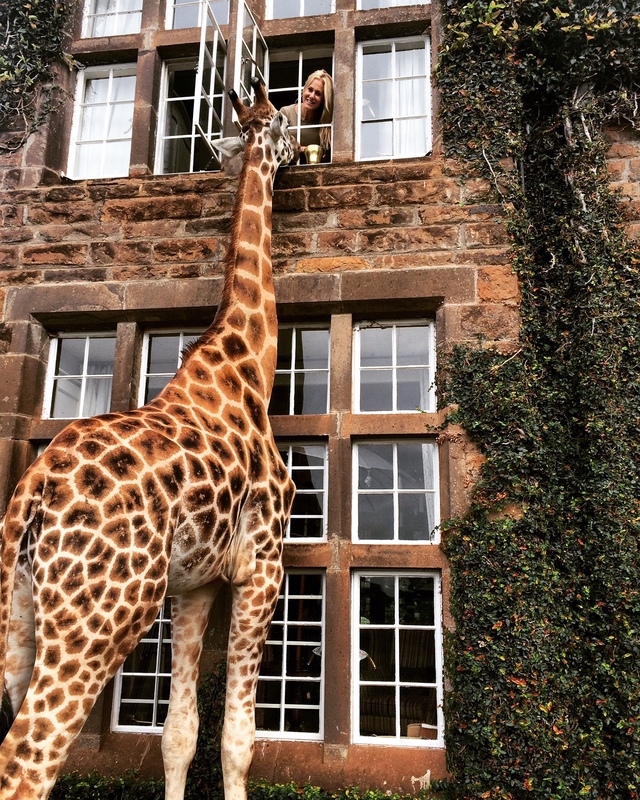 Our impeccable Itinerary planned by the luxury concierge, Katie Frederick* took us from Nairobi (brunching with giraffe) to Rwanda (hanging out with gorillas) to The Serengeti (watching sunsets during the Great Migration). *Ours was not a honeymoon. 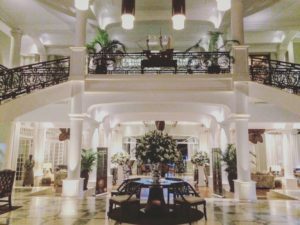 Katie curates custom, luxury vacations typically for newlywed clientele, but she’s an expert in travel planning despite the occasion. 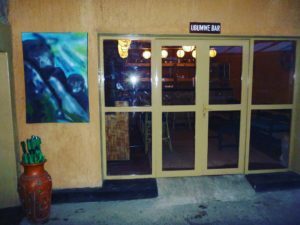 We discovered some fantastic food along the way and thought we’d share with a broader audience since East Africa gets little to no love or attention from the food connoisseurs of the world. Over a two week period with careful planning, the following places are quite reachable. All are enchanting from a cuisine, ambience and adventure perspective and we were left to our own devices, paving our own way on the food scene – no one writes about these particular experiences from a Tastemaker point of view – they haven’t made any acclaimed lists…yet and maybe they never will. Truly, why we like them? They’re exclusive. Hemingways Nairobi ~ Artisan cheeses and biscuits with mountain paw-paw jam await at this luxurious dining spot. There are many delicious dishes to choose from including karoo lamb chops with mint glaze and forest mushroom risotto. 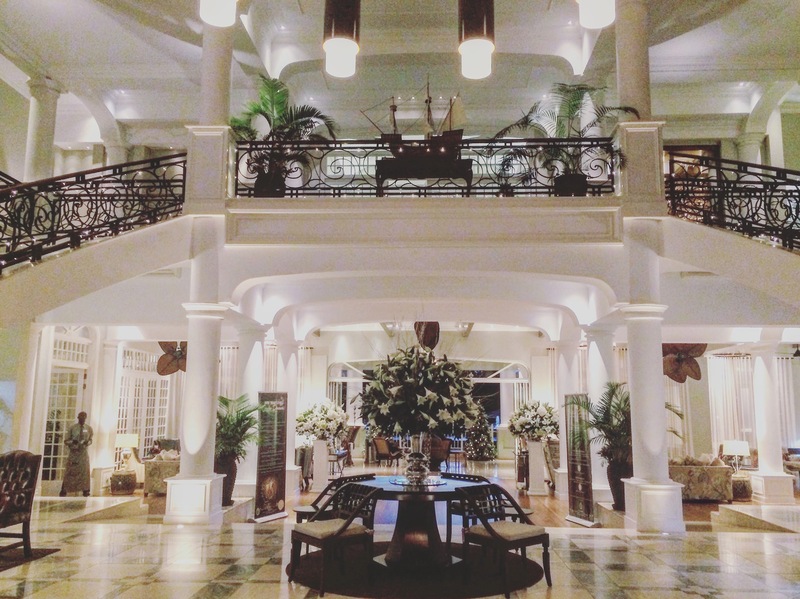 This lobby alone swept us away with its regal charm and elegance. 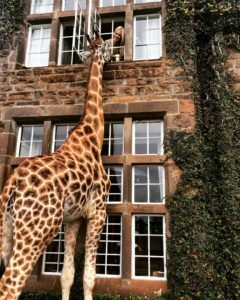 Giraffe Manor ~ picture yourself waking to the sight of giraffe poking their head into your hotel window! OMG! If that’s not magical enough, when you are seated for brunch, the giraffe join you at your table nibbling biscuits along side as you enjoy made-to-order eggs, fresh OJ, muesli and french press coffee. This place is unreal – straight out of a fairytale! 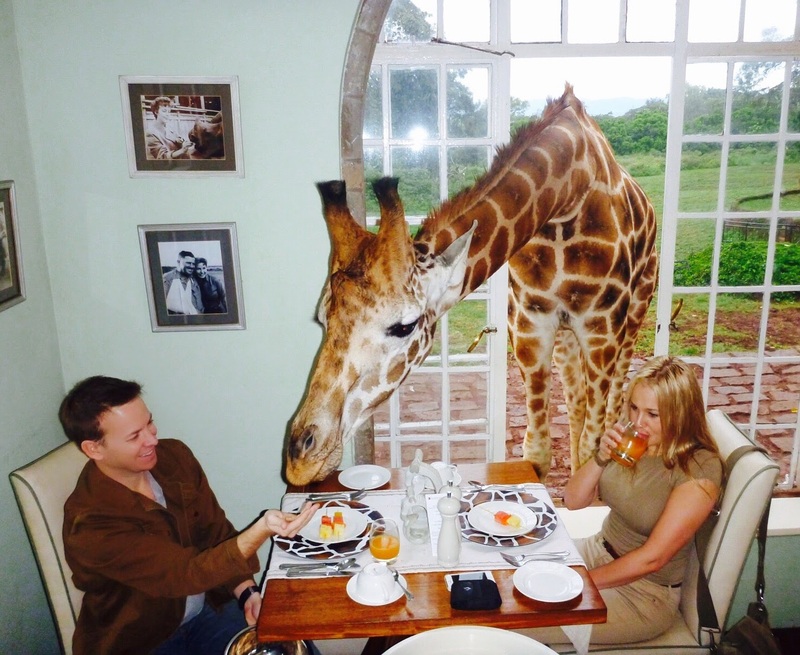 Our favorite meal of the entire trip was this brunch with Jacque, the giraffe. Heaven Rwanda ~ a fine dining roof deck restaurant, bar & boutique hotel overlooking the hills of Rwanda. An entirely romantic place during sunset with a well-thought-out and flavorful tasting menu curated by Executive Chef, Shaun Christian. Heaven restaurant sets the bar high for service-excellence and food quality. The breathtaking views and incredible food are reason enough to make the trip. Bar at Gorilla View Lodge ~ tucked away at the lodge is this inconspicuous six seat bar and arguably the world’s best bartender, Gilbert! This was the ideal place to play a game of chess, recharge after a day of gorilla trekking and get to know the locals. The local cocktail designed by Gilbert called “Ma Sans Dowa” combined honey, ginger, fruit juice, absolute, crushed ice, sprite, passion fruit and “tree tomato” also known as tamarillo. Another common combination for mixers combined banana with lemon juice- surprisingly good. Great little bar at the foot of the jungle! Personal Chef via DM Africa (Serengeti Mobile Camp) This service was entirely luxurious and entirely romantic. Never before had we been fussed over and waited on so diligently (in such a personal way) by such authentic and caring people. Staff and Chef are complete professionals and each dish they present is prepared fresh with a lot of heart, rich flavors, high-quality ingredients and lovely textures. Given that camp is set up on the Serengeti, Chef had all the necessary cooking apparatus to design gourmet meals from sunrise to sunset out of a tent. Amazing!! Breakfast and dinner were served at camp while mid-day game drives included picnic lunches to be enjoyed at our leisure in various places across the Endless Plaines – often from the hood of our land cruiser in a style the locals refer to as “baboon up the tree!” Given the wildlife is both lethal and unpredictable, our guide kept a watchful eye as we grazed on delicious treats. The Farm House Ngorongoro ~ this is a darling farmhouse and coffee plantation overlooking the rolling hills where the Maasai take refuge. In private villas, guests acclimate back to reality (most coming off of safaris). Daily we joined other guests in a massive dining hall enjoying three square meals a day – banquet style. 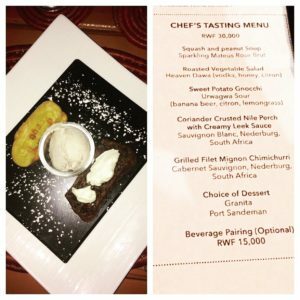 Cuisine here incorporated genres and flavors from around the world, creating a diverse selection of food to cater to a diverse group of travelers. We experienced Dodoma wine for the firs time – entirely lovely red wine from Tanzania gifted to us by our generous guide, Duncan. 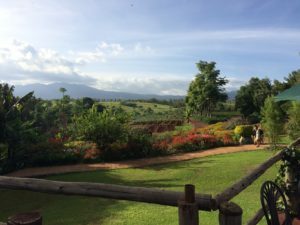 The view from the patio deck was magical with a ‘tea nook’ nestled in the back corner for sipping, plantation-gazing and soaking in the sun. When we left the great continent of Africa, we were forever changed and often reflect upon our time there ~ each memory conjuring positive feelings about humanity, life, death ~ the abyss of life’s mysteries. We came back to North America with even more questions than we had answers for and there’s something deeply satisfying about achieving that level of curiosity. Our wish is that every person will have or has had the opportunity to visit East Africa. Tourism dollars flowing into Rwanda will help their economy persevere, knowledge about the cuisine in Kenya has the potential to make Nairobi a culinary attraction and cuisine on the Serengeti – a entirely different spin on creativity! Take a 1st world chef out of their fancy kitchen, take away their state-of-the-art gadgets and expensive education then ask them to cultivate an entirely inventive, delicious, nourishing meal with nothing but an open flame and a spatula out of a canvas tent- ‘Chefs in the bush’ are geniuses of their craft and we have the deepest respect and gratitude for their expertise. Didn’t know this manor even existed. thoughts on the basic way of cooking still viewing it as gourmet is refreshing to read.